We really enjoy hearing from everyone so don't forget to write once in a while. I think I've fixed the problem with comments, let me know if otherwise. Even Pat the Cat can leave comments now! After hearing about first snow back home, we are appreciating the weather here on the Chesapeake. The days are gorgeous, 60-70's F but the nights are starting to cool down. We have been turning the heat on in the morning to help with the chill. The boat warms up fast, as usually we are peeling off layers within half an hour. We spent two nights in beautiful Tipers Creek up the Great Wicomico River on the Western shore of the Chespaeake. We wouldn't of known to explore Tipers Creek had we not met now great friends, on sv Chanticleer in Maine. They generously shared their dock on a beautiful secluded creek, their house and time with us. I'm guessing the Chesapeake has many secret gems like this. The chart for Tipers reads fairly shallow and we wouldn't of considered it (even with our new philosophy of "no worries, we still have a couple of inches of water under us") but with local knowledge had no issues. Ironically on the way out, after navigating past the tricky inlet to Tipers Creek, Pablo was admiring the beautiful scenery and sunrise a little too much, cut a corner and we bumped the bottom where the charts very clearly predicted we would! We have now settled into Deltaville, a small town with many marine services (not much else though), to get our last boat projects done before leaving the US. Pablo has been installing a water maker (desalinator) for the past week. This will allow us to spend more time in secluded areas, not to have to pay for water, nor worry about quality of water. It will allow us more showers, which is especially nice after swimming in salt water. Pablo is also finalizing our liferaft and solar panel install. Deltaville Marina is a great place for us to hang out. The pool and swings are popular with the kids. The facilities are clean and well cared for. Everyone here is a cruiser with an interesting story. Many Europeans and Canadians; most are preparing for a passage, like us. Pablo's brother Sterling arrives on Nov 5th. He will come along for the passage to the Caribbean. Pablo has started studying the weather and we plan to leave during for first good weather window after the 5th. Will fill in the details regarding the passage once it is a little closer. After patiently waiting for the tide to come up we left Tangier without incident. We had a beautiful late afternoon sail across the Chesapeake to Reedville. Cockrell Creek, the entrance to Reedville, is the home of the menhaden fishing fleet and processing plant. I read that menhaden are used for fish oil, meal and fertilizer which is made into animal feed, paint and cosmetics. The smell is staggering. I wasn’t sure we could stay. Luckily we found a beautiful anchorage a little upwind of it. We’ve come across several uncharted obstacles as we’ve sailed in the Chesapeake. 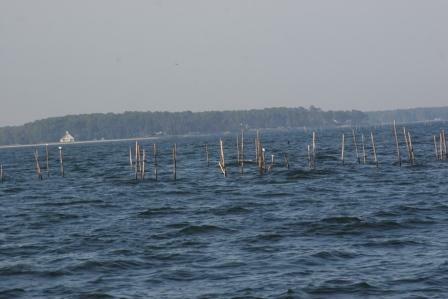 They are a bunch (hundreds) of sticks protruding in 30-40 feet of water, about ½-1 mile off a shore. See photo below. It must have something to do with the fishing industry. Luckily we’ve spotted them and changed course but in low light or at night they could be a hazard. Don’t understand why they are not on charts. We plan to move further up the Great Wicomico River this afternoon to visit fellow cruisers we met in Maine. Reedville fish processing plant, smell it in MA? Places like Tangier are what we look forward to most on this trip. This is a unique and genuine place. Tangier is an old watermans (crabbing and oystering) community off the Eastern Shore of Virginia. The island and culture is literally slipping away. 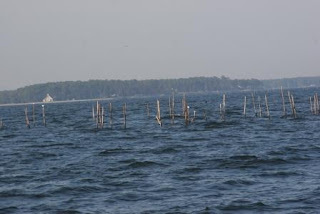 More than 9 acres per year are lost to the Bay due to erosion and sinking and the state of Virginia is no longer giving out crabbing licenses so families are forced to move away. Tangier is known for a unique old-world dialect with roots that go back to the original British settlers. We heard it in the local grocery store and couldn’t understand a word. In Solomons we started hearing the twang in speech and southern mannerisms (like ma’am, sir) but here there is no doubt we’re in the South. Everything seems slower, movement, speech…even the animals aren’t in a hurry. The number of cats, far outnumbers the human population of around 500. The girls enjoyed petting them. Pablo wasn’t so enthusiastic when they started jumping on the boat boat and the dockmaster started offering "three or four" to the girls. The entrance to Tangier is shallow and even though we were told that there was plenty of water we touched the bottom. We’re now waiting for high tide and crossing our fingers that we’ll be able to make it out without a tow. But couldn't ask for a better place to wait out a tide! Click here for an article about Tangier. We found the place and actual characters just as described. The Solomons area has been a wonderful place to explore. The Calvert Marine Museum, of local paleontology, marine science and maritime history, was a fantastic find. The staff was surprisingly knowledgeable and engaged the kids (and adults) for hours. The hands on exhibits were very well done. We spent a lot of time learning about the life cycle of skates and manta rays, the numerous fossils found in the Calvert Cliffs, and funny fish that like to squeeze in and hide in oyster shells. “The Calvert Cliffs are known around the world for preserving prehistoric seashells, sharks teeth, and fossilized remains of dolphins and whales”. Trust me, it really was fascinating, well done and an unexpected experience given we just visited the Smithsonian museums less than a week ago. We spent time visiting with cruisers we’ve met throughout our trip and met a few new ones. Really enjoying meeting new people and learning about their experiences. The girls tried their hand at crabbing. The line method seemed to work better than our trap. We didn’t catch enough for even an appetizer but learned a lot in the process. It seems Chesapeake crabs have better eye sight and are more aggressive than those we caught in Maine. We plan keep trying until we perfect our technique. Tomorrow morning we'll head further south. Not sure what our destination is yet, will decide along the way. We finally got out of Annapolis! I lost count but I think we were there for more than 10 days. Pablo had serious ants in his pants and was dying to move on. It was a test on multiple levels for us. We had little wind and thus not much power generation. Pablo hasn’t fully installed our solar panels but rigged them up temporarily which helped a little. We reached capacity on our holding tank. Our kids have been troopers about a lot of things on this trip but I think reached a limit when we told them they couldn’t use the bathroom until we could pump out. Something about not being able to use the bathroom for a bit makes everyone NEED to go NOW. As productive as our time is in places like Annapolis it is also very frustrating. We find it hard to bridge boat life and regular life. We don’t have all the ‘tools’ (like a car or two cell phones, unlimited power to charge computers etc…) to do things as efficiently as everyone around us, so it becomes frustrating after a bit. It is much easier to stay in more remote places where the pace of life is slower and thus our expectations seem to be lower also. Our trip to DC was fun and successful. I spent the morning in the State Department Office of Authentications. Bet you’ve never heard of that one. I had to get some documents authenticated in order for the Finnish embassy to release my passport. After delivering the docs to the very modern embassy building (fancy compare to the El Salvador embassy which was basically a strip mall store front with a flag in front) we saw the White House, had a tour of the Treasury Dept Bureau of Printing and Engraving (see Mia's blog for more info) and went to the Air and Space museum. I could spend a lot more time exploring DC. From Annapolis we sailed south to the West River and anchored for the night. In the morning we walked in to Galesville, a nice southern feeling town, to mail a letter. We spent the rest of the day sailing to Solomons, MD. Since we have been on a mooring in a protected anchorage (no wind) for more than a week we are low on power. Will have to elaborate on our adventures here once we have our batteries topped off. We will go into DC tomorrow and leave for the Eastern shore of Maryland on Wed..
After exploring Sassafras River we took advantage of NW winds to sail to Annapolis. We have the coldest weather we've encountered on the trip so far. In stark contrast to what we thought was summer yesterday, the high was in low fifties today with rain showers. This is the first day Pablo has worn pants since the beginning of the trip. We're anchored right in front of the Naval Academy in Annapolis. The big boat show is here next weekend and more prime protected anchorages are already full. We plan to explore Annapolis for the next couple of days. Hoping to find decent wifi to post pictures from the past days.